Tom Watson’s New Critics blog, had been hacked and he needed someone to rescue it. The site had been built on an old version of Wordpress and lived on a hosting service that Tom was no longer happy with. 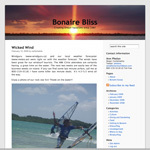 I was able to recover and export his content to rebuild the blog on a modern platform. Tom was back in business in a little more than a day.